For those of you who have never used binoculars with image stabilization, these types of binoculars can provide a stable, impressively crystal-clear viewing experience. Because of their image quality, they’re usually on the pricey side, but considering the type of image quality you’ll enjoy, many hunters, birders, and outdoor enthusiasts often feel that the price is a fair tradeoff. The Techno Stabi by Fujinon uses gimbal mounts in order to stabilize the prisms, resulting in images that don’t shake or move even when the user is on unsteady ground such as a plane, train, or boat. Additionally, the binoculars do an excellent job of keeping images stable and clear, even if the user’s hands are shaking. These binoculars are able to retain the sharpness of the image thanks to a couple of piezo vibration sensors. These sensors are used to detect cyclical and repetitive movements. In order to detect direction, the binoculars use an additional pair of gyro sensors. The microprocessor will take the input from the sensors to control the direct drive motor in order to instantly correct the movements to the mounted prisms located in the dual gimbal frame. Of course, with this type of technology, you can expect the binoculars to have more heft to them. So, are image stabilization binoculars worth the extra weight and the higher price tag? If weight is an important factor, especially if you’re hiking and desperately trying to keep your pack weight down, the Zeiss 8×42 Conquest HD binoculars is a nice compromise and offers comparable image quality at a more affordable price. When you’re on a boat, or in the car, it can be difficult, if not almost impossible to get a clear view of an animal, tree, or structure as you’re flying by. Often the image will appear shaky at best. But with image stabilization technology, it’s as though the surroundings have come to a complete standstill. If you’re wondering about the loss of stability when you’re quickly tracking an animal, motorcycle, deer, or a plane’s movement, rest assured that this system will not fail. However, the image stabilization feature does emit a high-pitched motor sound that can be somewhat alarming to local wildlife in a totally otherwise silent environment. These binoculars use a couple of AA batteries. If you’re not using the image stabilization feature and instead want to just use the model as a regular pair of binoculars, the image stabilization feature will shut off automatically within one minute of nonuse. This is done in order to conserve battery life. On the binoculars, you’ll find a small LED light that turns green when the binoculars are well-powered and red when the batteries need to be swapped out. While the user’s manual says that the batteries will only last for a few hours with continuous use, most users found that they actually last about four or five hours if the feature is periodically used. But overall, the cost of replacing the batteries can really add up. We recommend purchasing rechargeable batteries, so you’ll always have an extra set or two to take with you on your next outdoor adventure. Fortunately, these batteries are really affordable and offer a quick charge time. These binoculars will be perfect for a wide range of applications. Considering the manufacturer’s background in producing marine optics, they must have had sea life in mind when they created this model considering it can easily handle choppy water conditions that can make non-image stabilized models impossible to use. The binoculars will also work well for birders and hunters, as well as surveillance. Many users have reported that they’re also an excellent choice for concerts and sporting events. The binoculars feature a durable polycarbonate body that’s waterproof and internally fog-proof. The lenses have also been nitrogen gas purged. The twist up and down eyecups complete with detents are adjustable and comfortable. The binocular’s very small exit pupil means that you’ll need to keep the model’s exit pupil correctly aligned at all times. This can be difficult to adjust and because of this, we don’t recommend these binoculars to beginners. How to focus binoculars can be tricky, even with a standard pair, but the precision required to correctly align these can be difficult and very frustrating at times. If you’re in need of a pair of binoculars that are a little more beginner-friendly, please view our buyer’s guide for a look at some of the best-selling models of compact binoculars available. These binoculars offer stellar color fidelity and optical contrast. Equipped with roof prisms, you’ll enjoy the combination of image stabilization and crisply contrasted images. The Bak 4 roof prisms feature a phase coating. The lenses are multi-coated, which further enhances the binocular’s color and contrast fidelity. Like with most models of stabilization binoculars, you’ll find that the field of view is narrower than what you can expect from models that don’t use image stabilization technology. 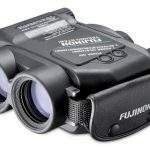 The four-degree field of view can make sighting a bird or other types of quickly moving images difficult when compared to binoculars that offer a wider field of view. Featuring a 14x magnification with forty-millimeter objective lenses, these binoculars are packing some serious optical power. Many users can agree that these binoculars offer a sharper, brighter viewing experience than competing models. These binoculars are definitely powerful and will come in handy for a number of applications. However, the fact that they can be difficult to adjust can be a big drawback for some users. Aside from the fact that adjusting these binoculars can take some getting used to, they’re clearly some of the best binoculars on the market. The type of image clarity they offer will blow you away. Want to take your birding to the next level? 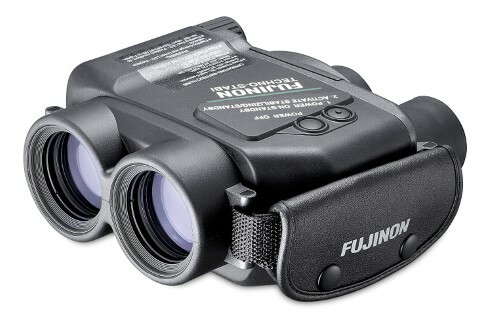 Then these Fujinon binoculars will be the last pair you ever buy. We gave these binoculars a rating of four and a half out of five stars.